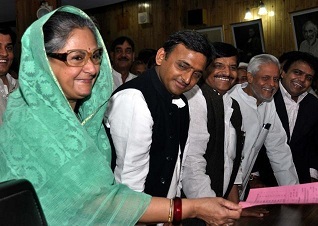 Jaya Bachchan on Saturday filed her nomination papers for the Rajya Sabha election as a Samajwadi Party (SP) candidate in the presence of the Uttar Pradesh Chief Minister, Akhilesh Yadav and senior party leaders. The actress, who is the wife of Bollywood icon Amitabh Bachchan, filed her nomination in the presence of Chief Minister Akhilesh Yadav and cabinet minister Shivpal Yadav. She is the sixth Samajwadi Party nominee to file her nomination for the Upper House. Naresh Agarwal, Kiranmay Nanda, Darshan Singh Yadav, Brijbhushan Tiwari and Munawwar Saleem had yesterday filed their nominations. Samajwadi Party, which has a strength of 225 (with one Independent MLA Raghuraj Pratap Singh alias Raja Bhaiya) in the 403-member Uttar Pradesh Assembly, can send six members to the Rajya Sabha. Jaya, who was a Rajya Sabha member during 2004-10 on an SP ticket, is among the party's six Rajya Sabha nominees. Naresh Agarwal, Kiranmoy Nanda, Darshan Singh Yadav, Brijbhushan Tiwari and Munawwar Saleem are the other candidates who have already filed their nominations. The state sends 10 members to the Rajya Sabha.